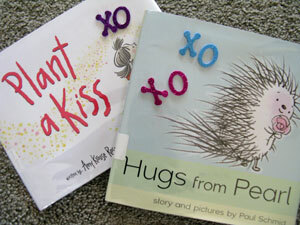 I noticed a theme as I recently searched through the new 2012 children's books appropriate for Valentine's Day: Hugs and Kisses! A plethora of XOXOXOXOXO with a smackerel of ♥ LOVE ♥. I've included a list below of the new titles in case you're planning a trip to the library this weekend. We're busily preparing for a science fair so we haven't had a chance to prepare much for Valentine's Day yet this year! I imagine we'll have a busy upcoming weekend. We have nearly 50 Valentines to write out for my kids' upcoming Valentine's Day class parties. Are you busy with Valentine's Day preparations? As a preschool teacher, I really appreciate your blog! Thanks for the great Valentine's book suggestions and awesome crafts. I loved both of these books! Thanks for including a list of new books, I am always on the hunt for those. I also really enjoyed Valentine surprise by Corinne Demas. I know what you mean about being crazy busy for Valentine's Day. We haven't even read many related books this year - Anna didn't seem to interested in them. Just got done decorating the table for Valentine's Day to surprise the kiddos. Have a good day tomorrow!